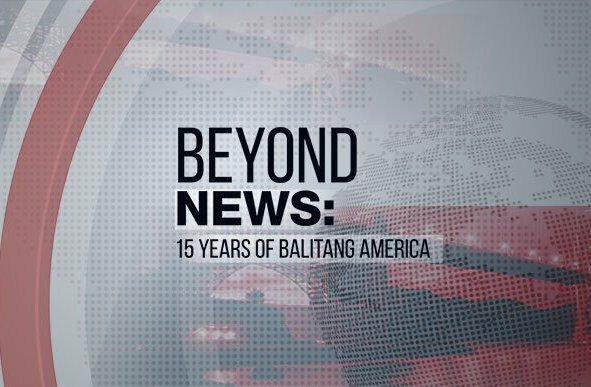 “Balitang America’s (BA)” presents Beyond News: 15 Years of Balitang America, a one-hour documentary that highlights the beginnings, the growth and the impact of the newscast in the last 15 years. The documentary can be seen on TFC online (www.TFC.tv) and internet protocol television (IPTV). BA has been the leading news source for Filipinos in North America since 2002. It is the only daily newscast that covers anything and everything that matters to Filipino Americans and Filipino Canadians. Through the years, BA has evolved from a weekly to a daily newscast that offers specials, documentaries, as well as town hall events on important topics like the elections. BA has also become a voice for the most underrepresented sectors in the community, a champion for social justice, and a unifying force for all Filipinos amid tragedies and calamities. BA has been recognized by reputable award-giving bodies like the Emmys, the Tellys, the New York Festivals, NAMIC Vision Awards, New America Media, and Plaridel Awards, among others. BA remains committed to produce stories that empower and news that connects our viewers for the years to come. Catch Beyond News: 15 Years of Balitang America on TFC online (TFC.tv) and TFC internet protocol television (IPTV).